It’s hard to choose between the beautiful spring blooms or the striking purple foliage as the best feature of Krauter Vesuvius’ purple leaf plum. This small deciduous tree begins blooming in April and flowers are followed by deep purple foliage. The light pink fragrant flowers form in clusters along the branches of the tree and are loved by butterflies. This tree seldom fruits, but any fruits that develop are typically enjoyed by birds. Due to it’s small habit this tree works beautifully in urban lots and can be used in various types of landscape styles. ‘Krauter Vesuvius’ does well in full sun locations but can take some afternoon shade in warmer climates. If this tree is planted in too much shade its foliage loses some of its deep purple hue. Purple leaf plum will require moderate watering once established, but may require additional watering during the summer months; especially in the warmer climates. 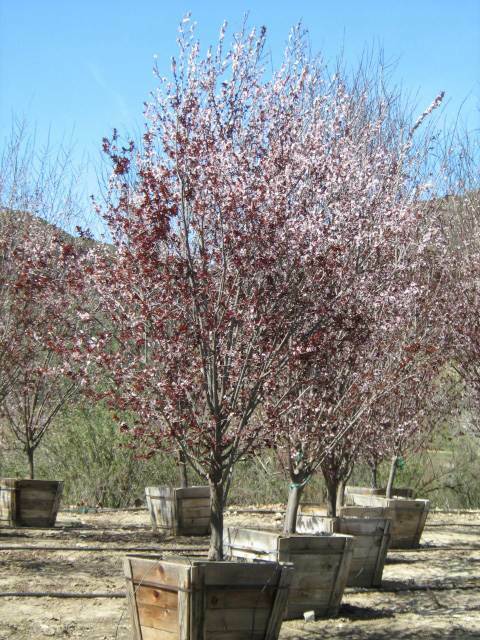 Be sure to plant this tree in well-draining soil to avoid root rot and other fungal problems. Fertilize regularly to keep your tree healthy as this will reduce its susceptibility to pest and other pathogens.